Last year, seeing the increasing trend of average discount together with knowing the fact that Boeing regularly increases list prices triggered the following question: Have Boeing airplane discounted prices increased, decreased or stayed constant in the recent years? I set out to answer this question using the estimated average discount of each year (1) from the graphic above. The Boeing list prices (LP) (2) can be found here. I have been recording those prices for years and thus have a table with the evolution of list prices for each model year by year. The following step is to apply the average discount estimated for each year to then-year list prices, to get the estimated discounted prices (EDP) (2) per model. Thus, a table can be built for the last 6 years. You can find below the result for the best-selling aircraft during previous years: 737-800, 737-900ER, 777-300ER and 787-8. Together these 4 models amounted to over 640 deliveries in 2014 or 89% of the total 723 airplanes Boeing delivered in 2014. 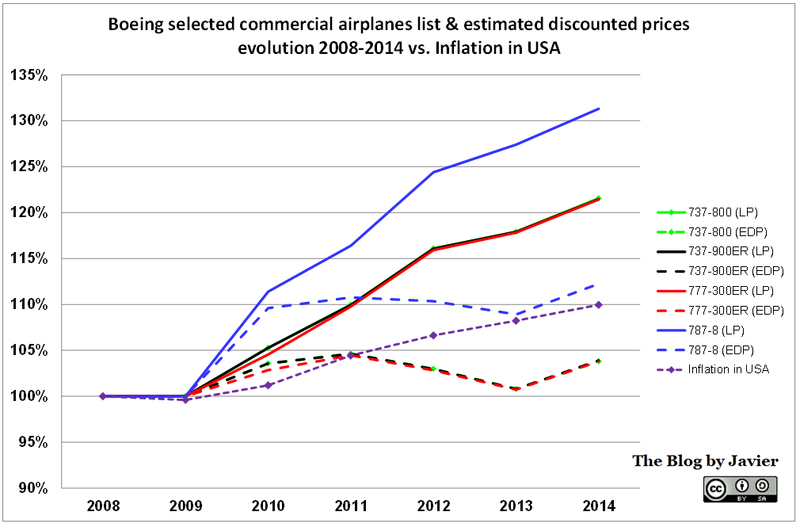 Boeing List and discount Prices evolution table, 2008-2014. In the table above I included in black figures what have been Boeing list prices of these models in the past years (as reported in their website) while I marked in blue the figures which are estimated, using as a departure point the calculated averages discounts per year (also included in blue in the table). I included as well the list prices year-on-year change as a % of the previous year list prices, per model. 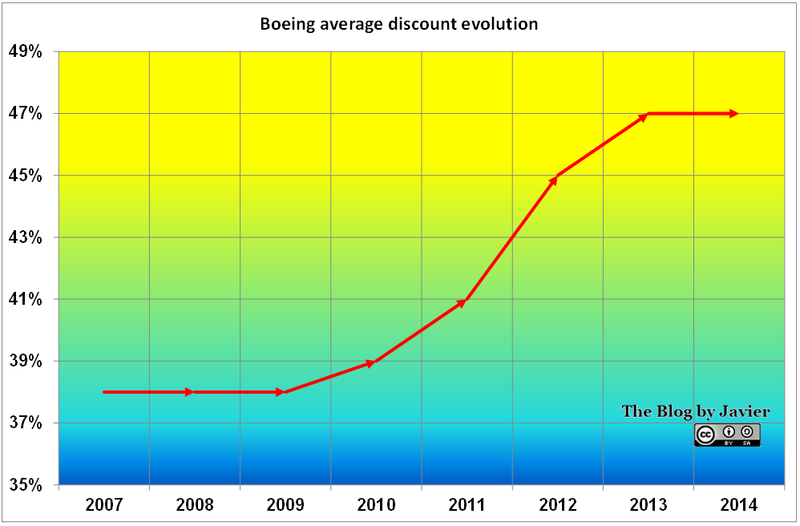 The average list price increase included at the bottom line is computed with the information of all Boeing models (19 in 2008 and 20 in 2014, though different ones (e.g. last year addition of 777-8X and 777-9X), a total of 26 different models along this period), not only the 4 included in this table. 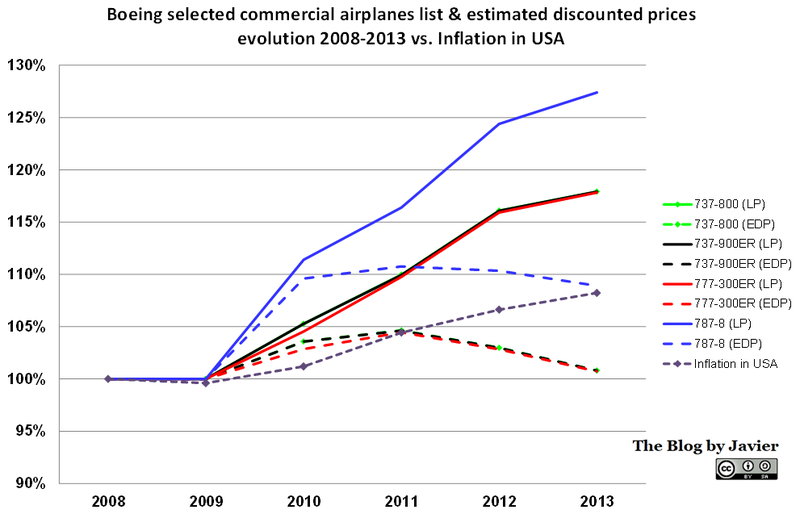 Boeing List & discount Prices evolution graphic vs. inflation in USA (through 2014). Through continuous increases, 2014 list prices were between 21% (737 and 777) and 31% (for the 787) higher than in 2008. However, due to increasing discounts from 38% in 2008 to 47% in 2014, the increase in list prices is almost entirely offset (especially for 737 and 777, just 4% above 2008 levels). 2014 discounted prices are below 2011 discounted prices for all models except 787. Boeing actually lost pricing power in both the 737 and 777, which are cheaper in real (inflation-adjusted) discounted terms in 2014 than they were in 2008 (about 6% cheaper). Only the 787 has been able to keep up the pace of discount escalation and inflation. (1) There is no way to know the real price and discount that Boeing applies in each sale, as it will depend from customer to customer (American Airlines -AMR- or Fedex) and from model to model (737-800 or 787-8). There where competition is tougher, discounts will be higher. However, the estimates I have made are an average of all Boeing aircraft sold in a given year. (2) Both list prices (LP) and estimated discounted prices (EDP) are expressed in then-year dollars. (3) US inflation series since 2008: -0.4% (2009), 1.6% (2010), 3.2% (2011), 2.1% (2012), 1.5% (2013) and 1.6% (2014).